One of the most common oral surgeries is tooth extractions. 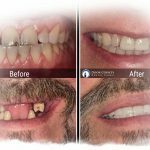 We strive to take great care in providing gentle, non-traumatic extraction for our patients. After the procedure is complete, we will send you home with instructions in order to keep the site clean and healthy. Our sterilization center includes autoclaves that sterilize all dental equipment and tools, according to the CDC (Center of Disease Control), on a daily basis. Weekly tests are run on our autoclaves to ensure they are working effectively. We take pride in delivering dental treatment in a safe, clean, and sterile environment.